The White Mountains cover about a quarter of the state of New Hampshire. This rugged New England mountain range also dips into the neighboring state of Maine. Several state parks, in addition to the White Mountain National Forest, make up the area, which is mostly public land. The mountains are part of the Appalachian Mountains, with a portion of the 2,100-mile Appalachian Trail traversing through the range. 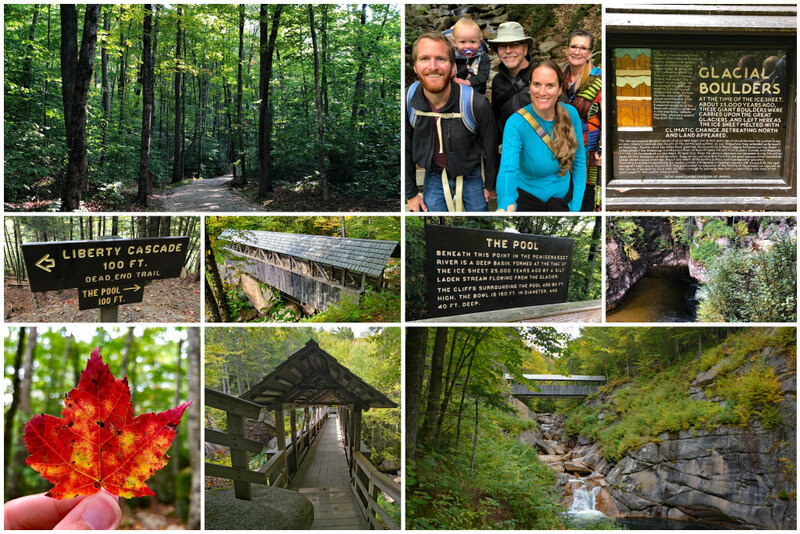 Just over 100 miles (160 km) of the trail meanders through the White Mountain National Forest. If you’re coming to the White Mountains from out of state or country, Boston (BOS) International Airport is probably your best bet. The journey from Boston to the White Mountains takes approximately 2-3 hours. Once you get the logistics of your transportation figured out, let’s get planning! There are so many wonderful things to do in the White Mountains! Our multi-generational trip to the White Mountains included us and our 1-year-old son, in addition to Sam’s parents who are in their early 60s. 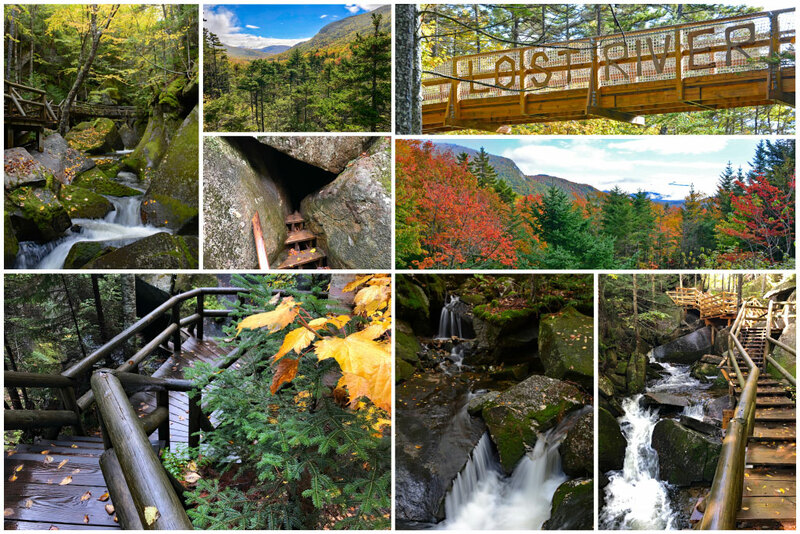 The White Mountains New Hampshire is a fun-for-all-ages family-friendly destination! The White Mountain National Forest covers approximately 800,000 acres (1,225 square miles) within the White Mountains. Like the mountain range, a small portion (~5.5%) of the forest is in the neighboring state of Maine. In fact, WMNF is the only National Forest located in either New Hampshire and Maine. And it is one of the most heavily visited National Forests in the US. TIP: When you are in the White Mountain National Forest, be sure to have a National Forest Recreation Pass ($5*/daily). 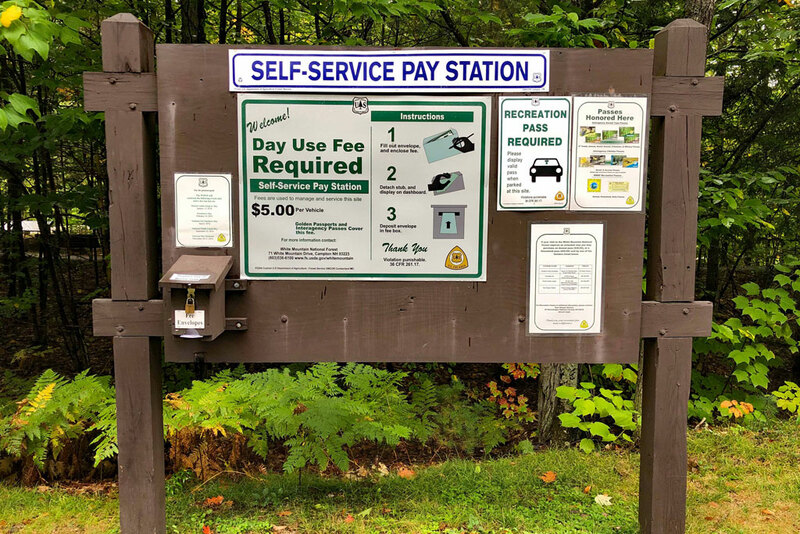 Self-service pay stations (see image below) can found at popular parking areas/trailheads around the forest. You can also purchase a pass at local area business, USFS Information Centers, and at the White Mountains Visitor Center (mentioned next). Annual National Forest Recreation Passes are available for $30* single/$40* household. *Prices are subject to change. 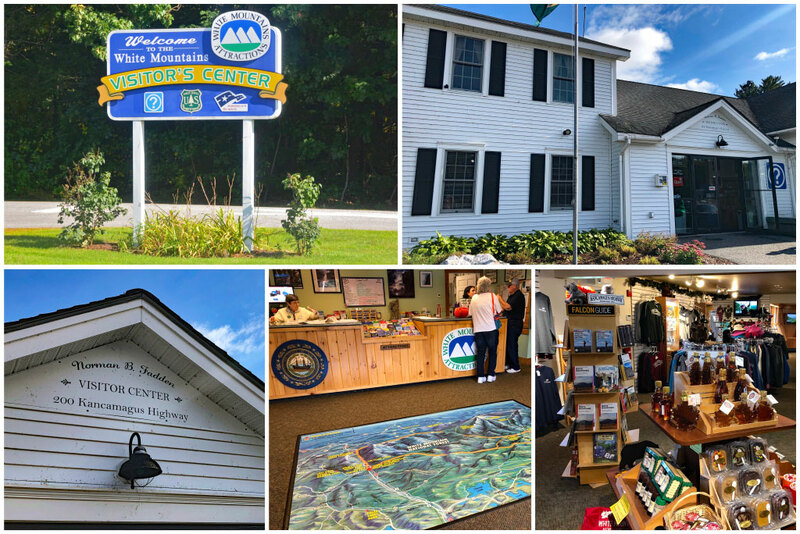 Be sure to stop by the White Mountains Visitor Center located off I-93 (Exit 32) to pick up some free brochures, maps, and local tips. Here you can purchase guide books, souvenirs, local products, a National Forest Recreation Pass, or a White Mountains Attractions Value Pass, which we’ll cover in the next segment. 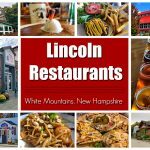 The center is staffed with knowledgeable locals who can give you tips on White Mountains attractions and places to eat in Lincoln. We had several delicious meals during our visit, so we’ve got some great Lincoln restaurant recommendations of our own! The White Mountains Attractions Value Pass (WMAVP, as it shall henceforth be known) is your DISCOUNTED ticket to the area’s hottest attractions! 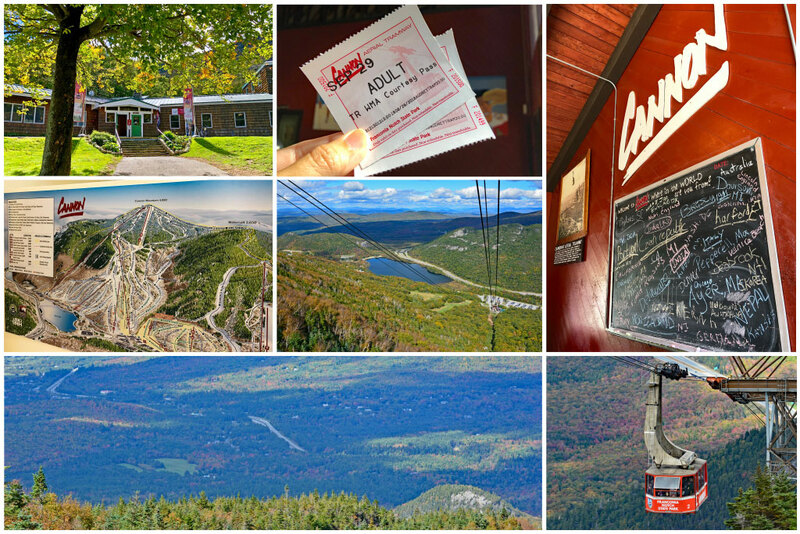 Save close to 70% on admission prices to 17 White Mountains Attractions! The 2019 WM Attractions Value Pass costs $399 and offers a value of over $1,200. Each pass (valid summer and fall only) is good for two admissions to each attraction highlighted below. We were only able to do 7 of the 17 attractions included on the pass (so not even half) and we still came out ahead! There are a limited number of passes sold each year, so act quickly if you want to get in on the savings! Go to www.visitwhitemountains.com for more information and to secure your White Mountains Attractions Value Pass before they sell out for the season! 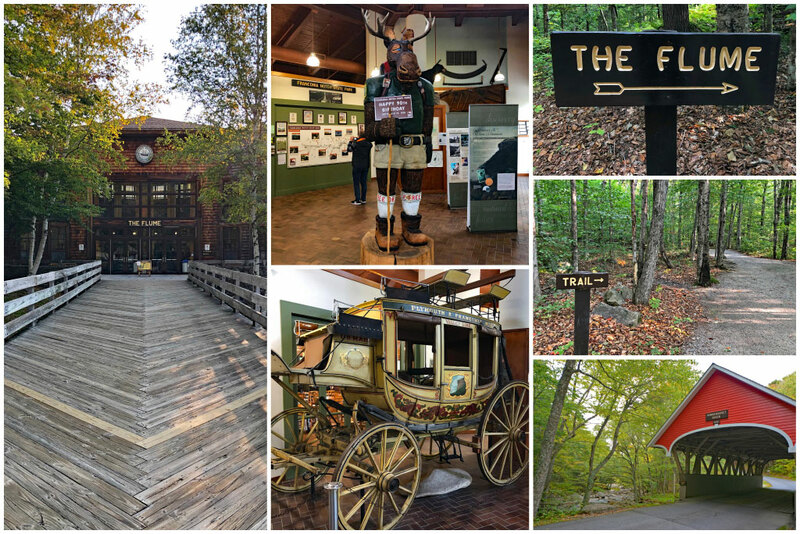 Start your visit to Flume Gorge with a visit to the Gilman Visitor Center, located within Franconia Notch State Park. Here you can obtain your tickets for the gorge and see the state park system’s historic Concord Coach. At the visitor center, you can also purchase a snack or souvenir. In addition, learn more about the state park through an educational 20-minute movie. 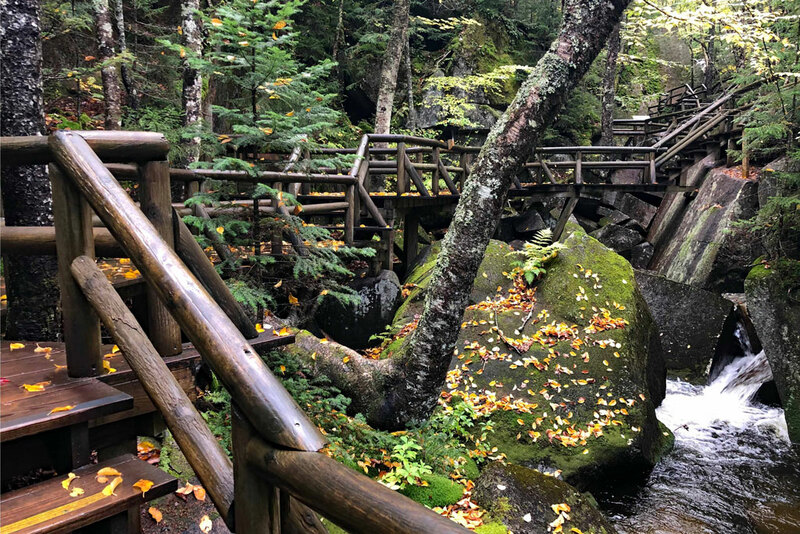 Please note that Flume Gorge is only open to visitors May through October (weather permitting). Also note that pets are not permitted in Flume Gorge (or the visitor center). Check their website for more information, including precise dates and hours of operation. There is a shuttle bus that takes visitors from the Gilman Visitor Center to near the start of Flume Gorge. We chose to walk the extra 0.7 miles on the well-marked trail leading to the Gorge. It’s important to note that the trail through the Gorge is not wheelchair accessible. The path includes a good amount of stairs and uphill walking. On the way to the Gorge, you’ll pass a red covered bridge that was built in 1886, making it one of the oldest in the state. Though, you might be able to tell, it has been restored several times. As you walk through the Gorge, take time to read the signs about how this natural chasm formed and how it was discovered back in 1808. As you wander 800 feet through the gorge, gaze up at the walls of granite that rise to a height of 70 to 90 feet. Stand in awe as water rushes below the boardwalk and wooden stairs leading through the gorge. 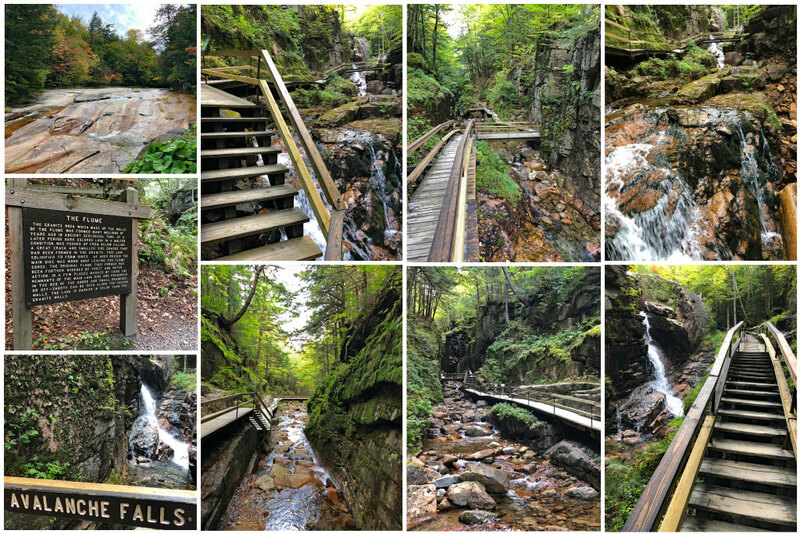 For a fun activity with the kids, print out this Flume Gorge Scavenger Hunt created by NH Parks & Recreation Department, prior to your visit. Upon exiting this natural wonder, the adventure continues as you traverse a total of 2-miles of scenic walking trails. Visit other points of interest, such as Liberty Cascade, The Pool and Sentinel Pine Bridge. TIP: If you plan on also visiting the Cannon Aerial Tramway, but will not be getting the White Mountains Attractions Value Pass, consider getting the Discovery Pass which will give you discounted admission to both attractions! Lost River Gorge is absolutely GORGE-eous! 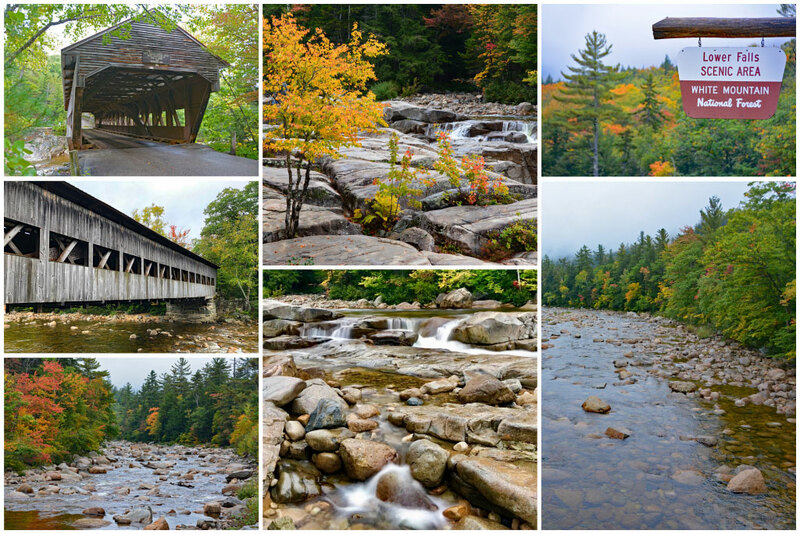 Beauty abounds at another one of New Hampshire’s greatest natural wonders! Follow the mile long boardwalk that meanders along and above the Lost River in Kinsman Notch. The path contains over 1,000 stairs. Furthermore, the path also takes you past several boulder caves that only the adventurous and nimble should attempt squeeze through. You are more than welcome to bypass the caves if you’re not feeling particularly pliable. There was one small section of the trail that was a little difficult for us to navigate with our son in a baby carrier backpack. But we just took our time and all was well! 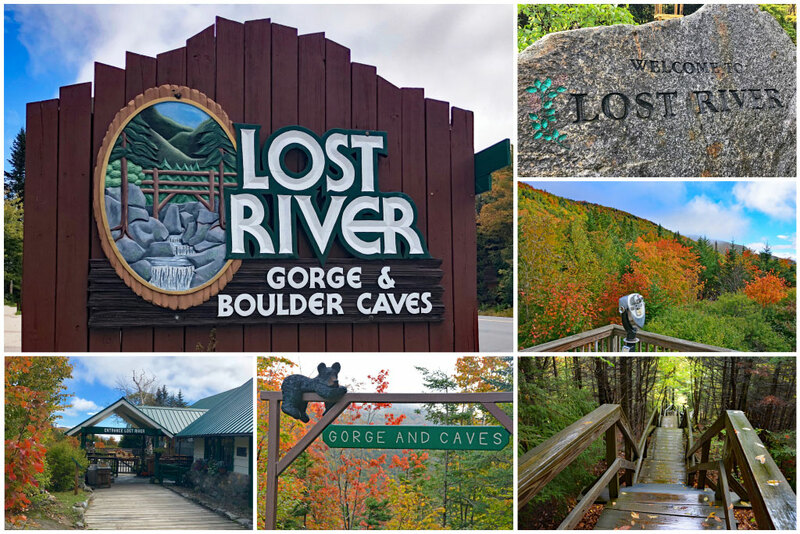 Lost River is truly a beautiful area that should definitely make its way onto your Things to Do in the White Mountains itinerary! Over 1,000 steps guide you through the gorge… sturdy footwear is encouraged! Recent additions include a treehouse, bird’s nest lookout, and a suspension bridge. Lost River Gorge and Boulder Caves is open daily from mid-May to mid-October (weather depending). For more information, including hours of operation and ticket prices visit the Lost River Gorge website. 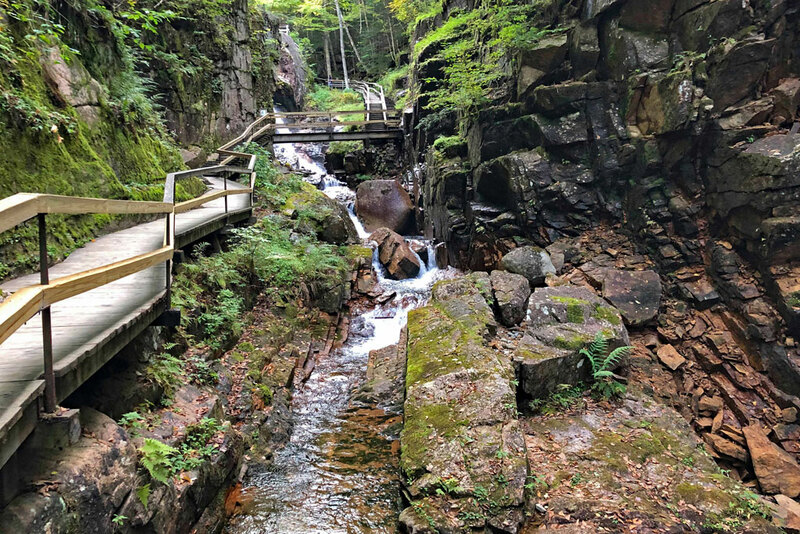 And be sure to check out our easy hikes in the White Mountains New Hampshire post for even more great family friendly hikes in and around Lincoln NH. Soar 200 feet above the forest floor at speeds of up to 60 miles per hour at the largest and most award-winning adventure destination in New England! In addition to ziplining, Alpine Adventures offers off-roading excursions in their unique 6-wheel-drive Pinzgauers. With 300 private acres to explore, there’s no telling what fun you’ll discover! The adventure continues at their Big Air Bag Launch Zone and Thrillsville Aerial Park. 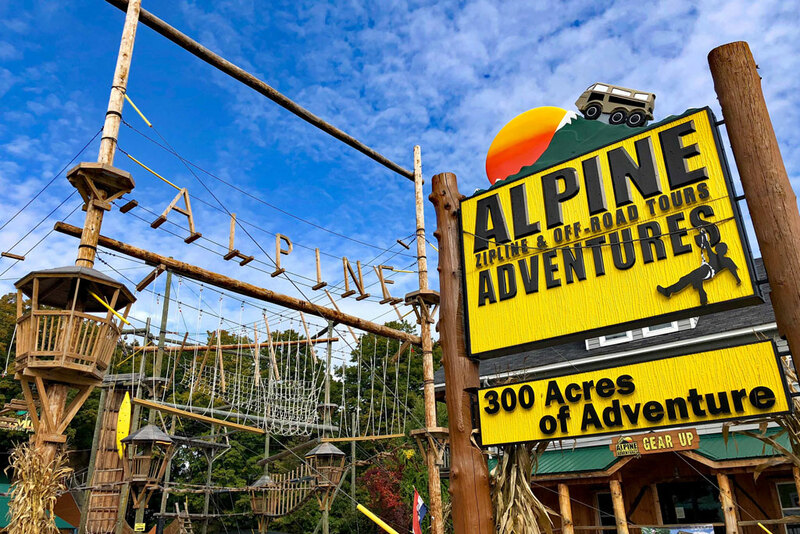 For more information about their year-round tours visit Alpine Adventure’s website. Squeeze in! The Cannon Mountain Aerial Tram cars can hold up to 80 passengers! Back in 1938, Cannon Mountain became the site of the very first passenger aerial tramway in North America. The original tramway (two 25-passenger cable cars) has since been replaced with the current system, now two 80-passenger cars. A ride on the Cannon Mountain Aerial Tramway will bring you to the 4,100 foot summit of Cannon Mountain in just under 10 minutes. If you are blessed with clear weather the day you visit the summit, you will be able to see 4 states (New Hampshire, Vermont, Maine and New York) and Canada. A short path leads to the summit observation tower which offers some of the most spectacular views in the White Mountains. Congratulations! You have just reached New Hampshire’s highest lift-accessed point! To celebrate, grab a beer at the highest taps in the state or get a bite to eat in the cafeteria. Open May-October (weather permitting). If you’re feeling extra adventurous, buy a one-way hiker ticket and hike up or down the mountain! 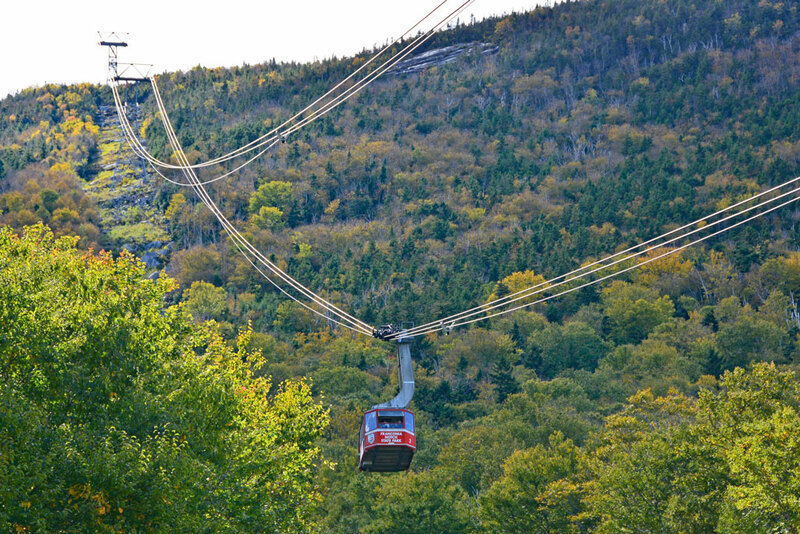 For more information about the aerial tramway, visit Cannon Mountain’s website. 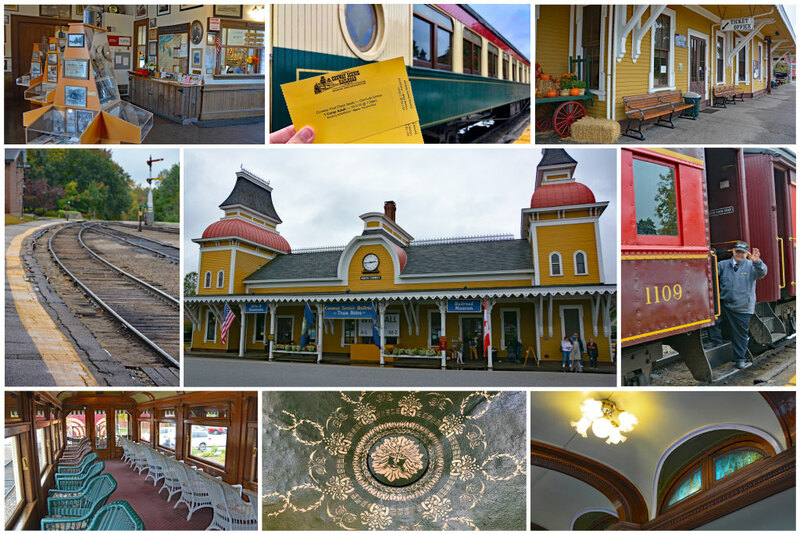 Departing from the elegant 1874 Victorian Station in North Conway, the Conway Scenic Railroad has several experiences for you to choose from. 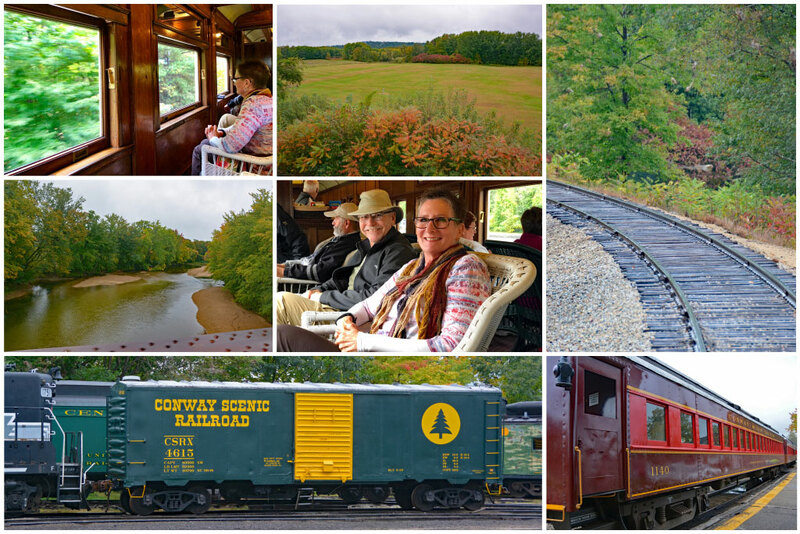 Take the Valley Train to Conway (11 miles/55-minutes) or Bartlett (21 miles/1.75 hours) or climb aboard the Notch Train for the legendary Crawford Notch excursion (5.5 hours). Once you decide on the journey type, select from Coach, First Class, or Dining Car seating. We rode on the historic Gertrude Emma First Class Car, built in 1898. Because we had our 1-year-old son with us, we opted for the 55-minute Valley Train. Though truth be told, we wish we would’ve chosen the longer Bartlett journey. It was fun to ride in the historic first class car, but the scenery was rather bland. Unfortunately the weather was not on our side the day we chose to ride. There very well may have been some beautiful vistas and mountain peaks hidden behind the low hanging clouds. It was still a fun experience nonetheless and one we recommend. Conway Scenic Railroad hosts several special event trains throughout the year (Murder Mystery Dinner Trains, Autumn Express, Pumpkin Patch Express, Santa’s Holiday Express, and Journey to the North Pole). Check the Conway Scenic Railroad website for current rates, season dates, and more information. Conway Scenic Rail is fun for the whole family! 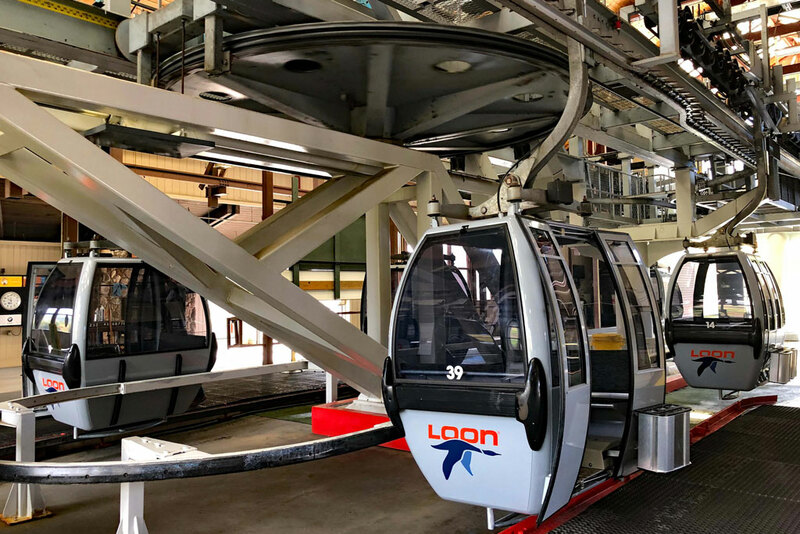 The gondola skyride at Loon Mountain Resort is New Hampshire’s longest, taking riders to an elevation of 2,733-feet. 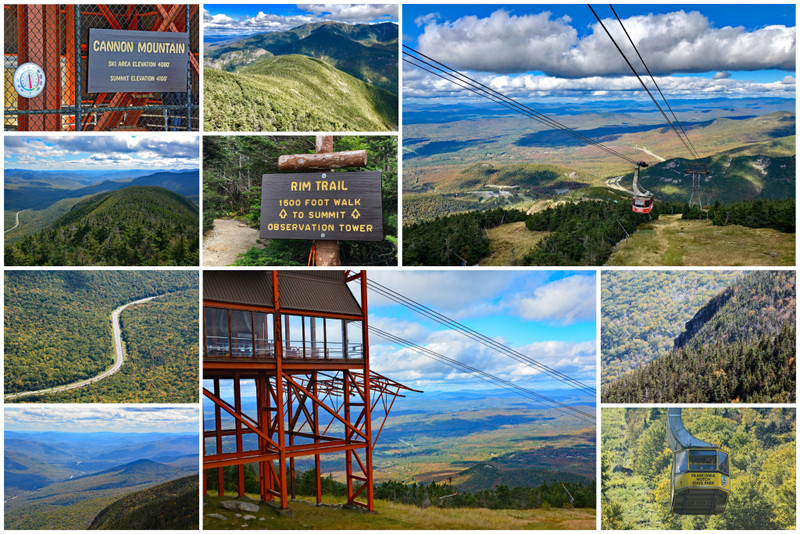 Once at the summit of Loon Mountain, explore glacial caves, climb the observation tower, and enjoy super scenic views at the Summit Cafe while you dine! There’s also a mountaintop playground for kids. 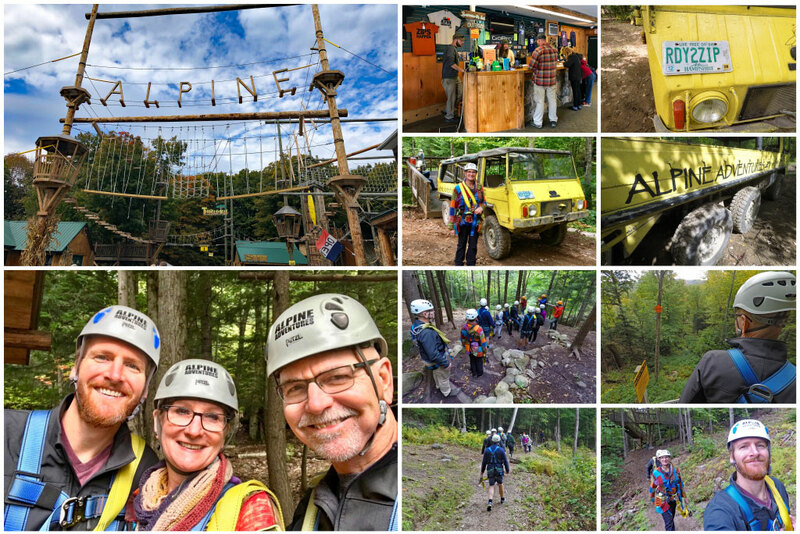 Down at Loon Mountain Resort’s Adventure Center at the base of the mountain, zipline across the Pemigewasset River, get lost in the LogJam Maze, scale the rock climbing wall, and more! These are for an additional cost. For rates and hours (which vary by season), visit the Loon Mountain Resort website. 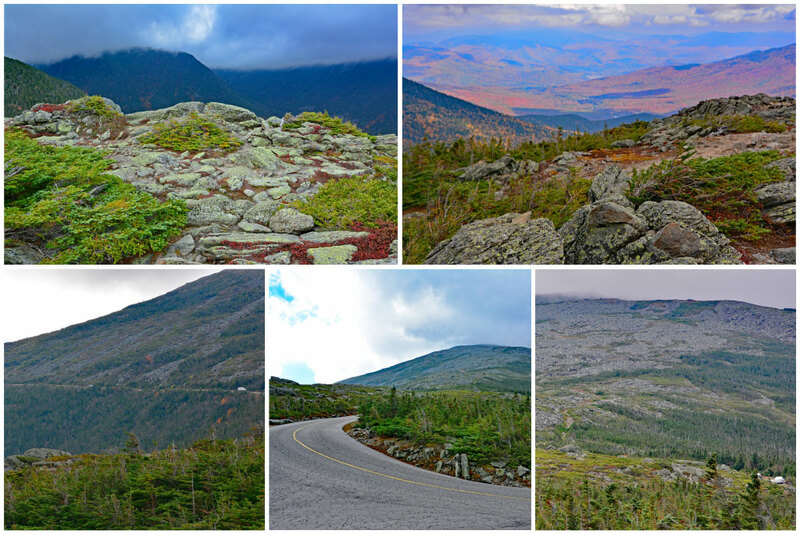 Take a drive on the highest peak in the northeast! Though if windy roads with occasional limited visibility and steep drop-offs make you uncomfortable, maybe leave the driving to someone else! 2-hour guided van tours are available for those wanting to take a backseat. The Mount Washington Auto Road is a toll road, so you’ll need to pay before making the 7.6 mile drive to the summit (6,288 feet). If you choose to drive yourself, you’ll get a CD to narrate your drive up and down the mountain. You’ll also be the recipient of the famous “This Car Climbed Mt Washington” bumper sticker! The summit of Mount Washington is covered in clouds 60% of the time. Extreme weather is fairly common at the summit and occasionally the road will close due to inclement conditions. It is for this reason that the road is not open past the end of October. Winter conditions on the mountain are simply not conducive for visitors. In April of 1934, the observatory at the summit recorded a wind speed of 231 mph (372 km/h)! This remains a world record for a land-based weather station. So, unfortunately the odds are against you for a clear view at the top. If you have a break in the clouds, consider yourself among the lucky ones! However, even if visibility at the summit is less than ideal, it’s still a drive to remember! The average grade of the Mt Washington Auto Road is 12%. This magnificent road was completed in 1861. For over 150 years now, people from all over the world have driven the the road, making it the first and oldest man-made attraction in the US. More than 250,000 visitors make their way to the summit each year. The average temperature on the summit is 26.5 F (-3 C). Even in July, the average temperature at the summit is 49 F (9.4 C), so be sure to bring a jacket. The highest temperature on record is 72 F (22.2 C), while the record low is listed at -47 F (-43.8 C), not factoring in wind chill. The road is open mid-May to late October (weather permitting). For more information about the Mount Washington Auto Road, visit the MW Auto Road website. 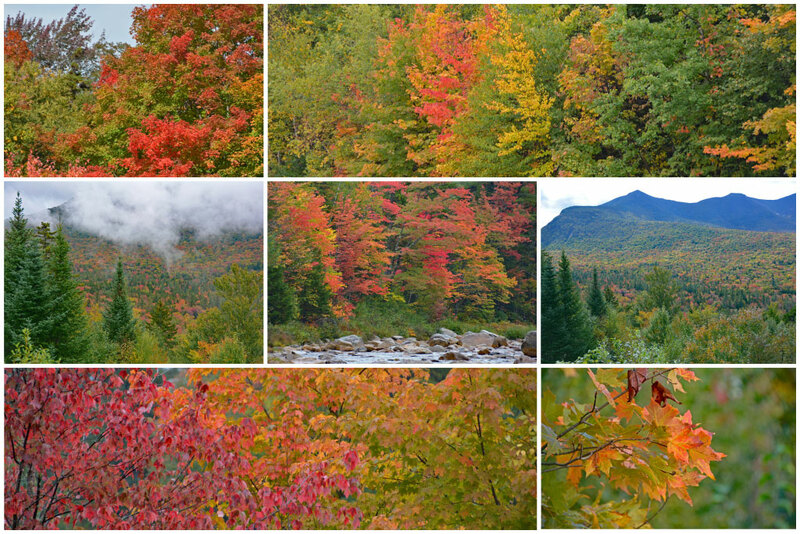 PS – Fall is an absolutely gorgeous time of year to visit the White Mountains. 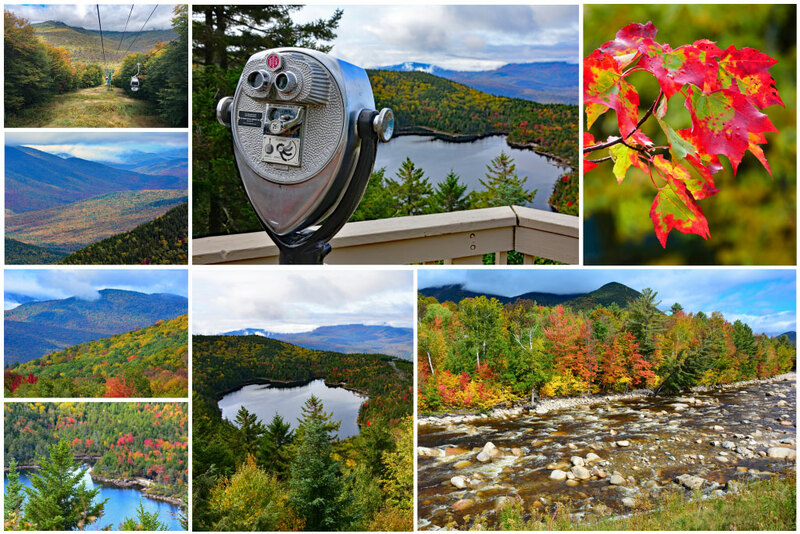 The views of the surrounding foliage from Mt Washington are spectacular! The following attractions are also included in the White Mountains Attractions Value Pass. However, we did not personally experience these activities during our visit to the White Mountains. Despite this, we wanted to make sure to highlight everything included in the value pass, so you can get an idea of its worth. Again, we only did 7 of the 17 activities included and still came out ahead, so it truly is a great value! The Mt Washington Cog Railway, a National Historic Engineering Landmark, was built in back 1869. Quite an impressive feat of engineering at its time! It is the world’s first mountain-climbing cog railway, and currently the only cog railway east of the Rocky Mountains. 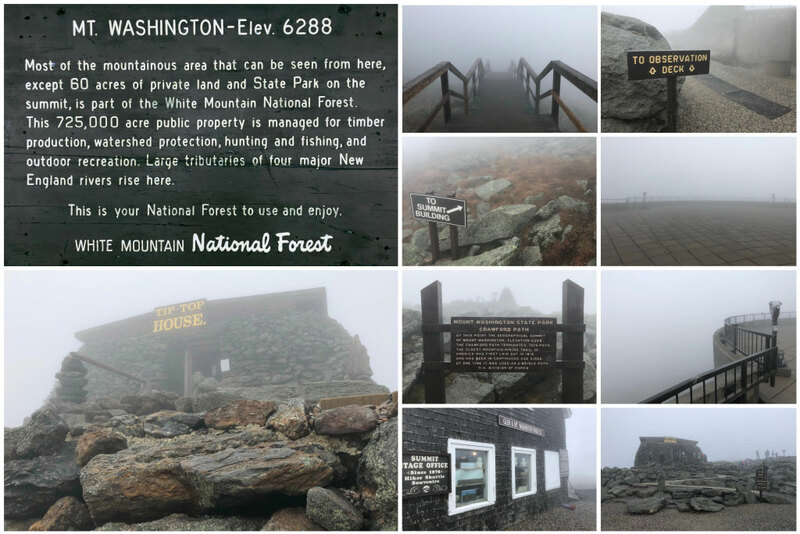 A three-hour round-trip journey takes you up 3 miles to the summit of Mt Washington. The ride each way takes about an hour, giving you an hour to explore at the summit. Choose from the vintage coal-fired steam train or the eco-friendly biodiesel train. Train cars are enclosed and heated when necessary, running in all weather. Advanced reservations are strongly recommended, as the trains can and do sell out. TIP: Save $15 by booking the last train of the day! If you’re feeling up for a challenge, purchase a one-way ticket on the cog railway and hike the other half of the journey. Trains run May through November. For more information, visit the Mt Washington Cog Railway website. Take a ride on a restored vintage coach car for an 80-minute (15 mile) excursion along the banks of the Pemigewasset River. The Hobo Railroad rides along a historical rail line built back in 1846. The on-board entertainment is fun for the whole family! 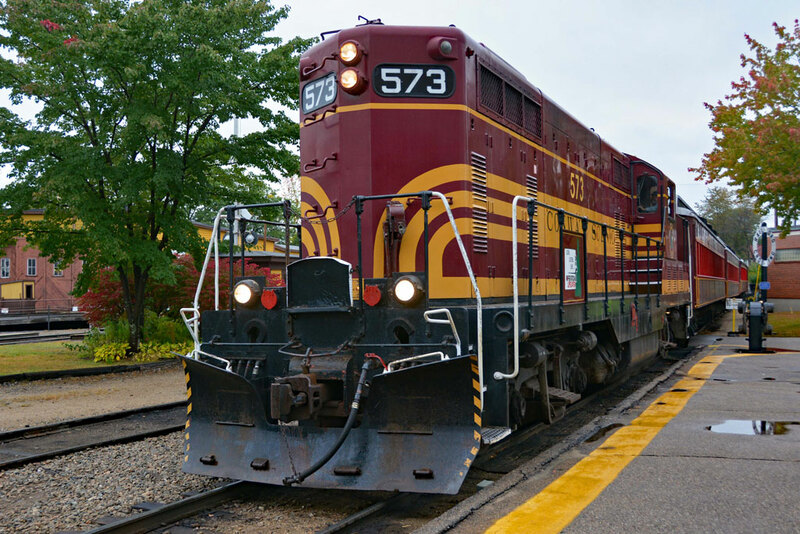 There are a variety of specialty trains throughout the year, including the Santa Express Train which runs late November through mid December. The Hobo Railroad is open Memorial Day through late October. For more information, including specific dates and hours of operation, in addition to ticket prices, visit the Hobo Railroad website. If you feel the need for speed or adventure, head on over to Cranmore Mountain Resort! Take a thrilling ride through the woods on the Mountain Coaster. Zip 700 feet down the mountainside on a suspended cable on the Soaring Eagle. Fly high in the sky on the Giant Swing. Enjoy zip lines, air bridges, cargo nets, and more on the Aerial Adventure rope course. Whiz down the summer tubing hill and/or enjoy a scenic chairlift ride to the mountain’s summit. All of this and more await you at Cranmore Mountain Resort. The resort is open mid-May through Columbus Day. For more information, visit the Cranmore Mountain Resort website. There’s also no shortage of adventure at Attitash Mountain Resort. The ZipTour is the longest single zip span in the East! Zip from the summit of Bear Peak to the base of Attitash Mountain. Attitash is also home to North America’s longest alpine slide. It’s over a mile long! The Nor’easter Mountain Coaster starts with a scenic 1,420-foot trip straight uphill before an exhilarating 2,880-foot journey down through the forest. As you can see, there’s plenty to do at Attitash Mountain Resort to get your heart racing! 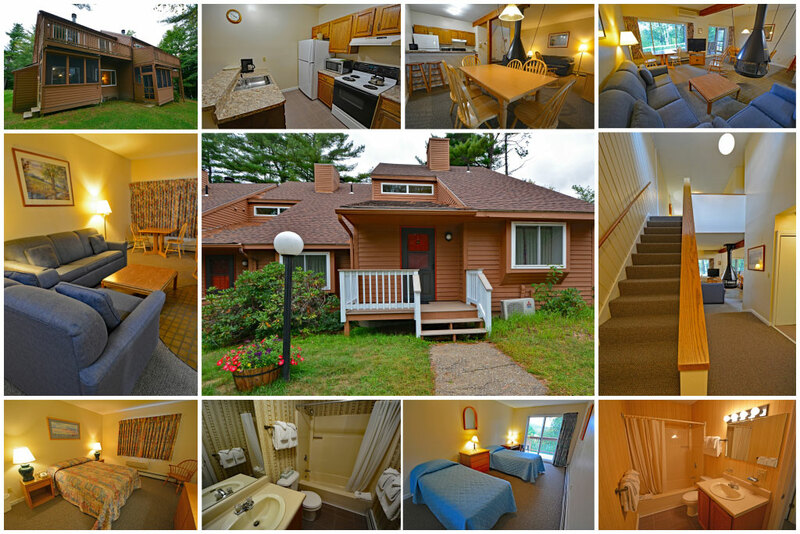 For more information, visit the Attitash Mountain Resort website. Can’t get enough zip line? Well, you’re in luck! The Wildcat Mountain ZipRider takes you soaring a 1/2 mile over trees, trails, and the Peabody River at speeds of 45 miles per hour. 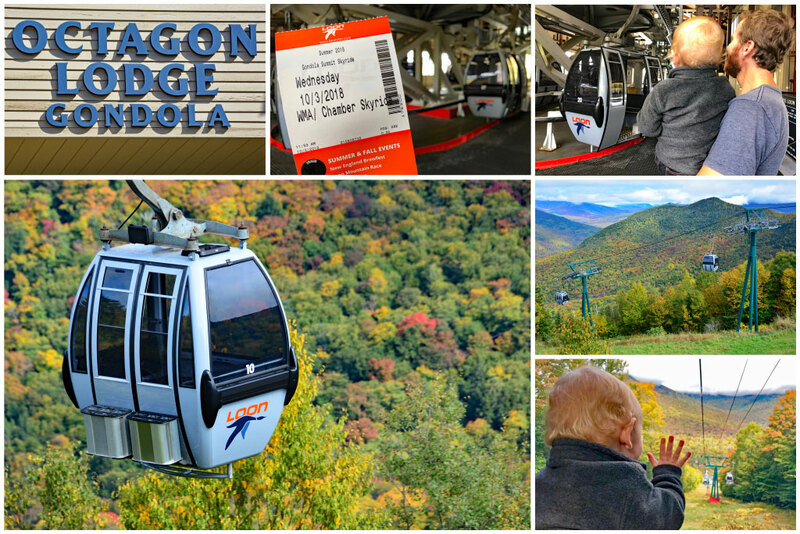 For even more scenic views, ride the Wildcat Express Gondola Skyride to the 4,000-foot summit of Wildcat Mountain. For attraction ticket prices, dates and hours of operation, visit the Wildcat Mountain website. Other area attractions included in the White Mountains Attractions Value Pass that are more specifically geared toward younger visitors and their families and include Polar Caves Park, Santa’s Village, Story Land, Whale’s Tale Water Park, and Clark’s Trading Post*. *Please note, we do not personally support establishments that hold animals captive for the entertainment of visitors. 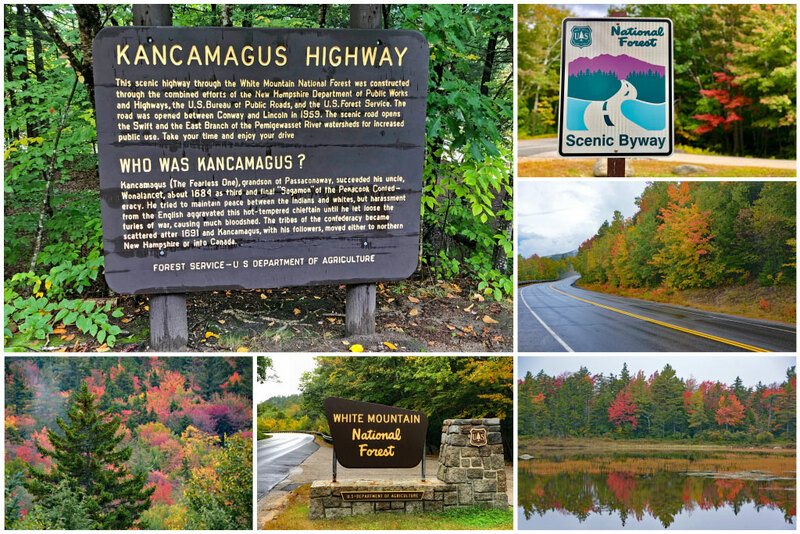 The Kancamagus Highway (pronounced Kank-ah-mah-gus), is often referred to simply as “The Kanc”. 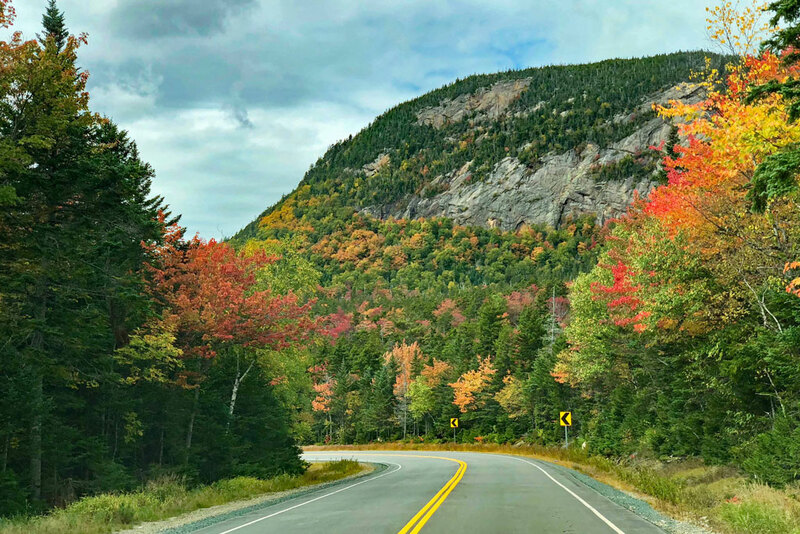 This scenic byway is a 34.5 mile drive along New Hampshire’s Route 112, connecting the towns of Lincoln and Conway. The road took an astounding 22 years to build and opened to the traveling public in 1959. It’s one of the top things to do in the White Mountains… especially in the Fall! 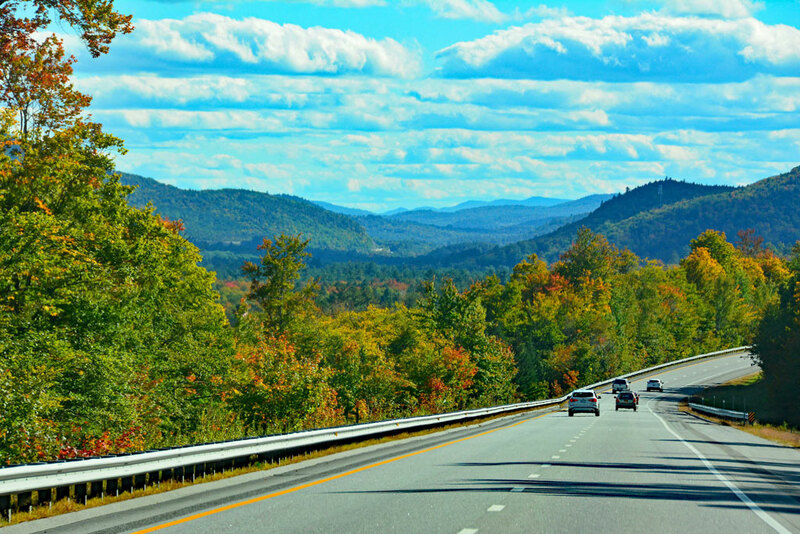 The highway takes you right through the heart of the White Mountain National Forest. REMINDER: If you plan to stop and hike at one of the many points on the Kancamagus Highway, you will need a National Forest Recreation Pass. 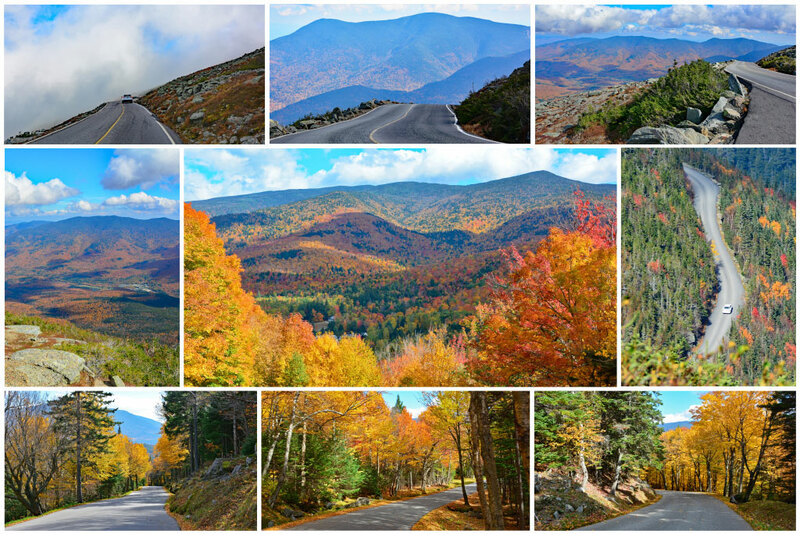 The Kanc is one of America’s most popular drives for leaf-peepers in the Fall. The vibrant foliage is simply AMAZING! Don’t worry, there are several places for you to pull over and enjoy the surrounding scenery. In addition to several scenic pull offs, there are many great places to get out and explore along the route. The following stops are listed in order of location when traveling from Lincoln to Conway. Just past Loon Mountain in Lincoln is Lincoln Woods Trail. This 2.6 mile scenic trail runs beside the Pemigewasset River along an abandoned railroad grade. (Pemigewasset translates to “swift or rapid current” in the Abenaki Indian language.) Almost 15 miles (20 minutes) further down the road is the trailhead to Sabbaday Falls. Stroll a quarter-mile on an accessible gravel path to a picturesque 45-foot waterfall and gorge. Less than 3 miles further is the Russell-Colbath House. The house was built in 1831 and is the only surviving early homestead in the Swift River Valley. From here, continue another 5 minutes on the Kanc to the Rocky Gorge Scenic Area. Here you’ll find an easy walk along the Swift River to a footbridge that spans the river. Another 2 miles down the road and you’ll arrive at the Lower Falls Scenic Area where the river flows over smooth granite rocks into a large pool. Lastly, less than a mile from Lower Falls you’ll come to Albany Covered Bridge. It’s one of a few bridges in the state of New Hampshire still open to motor vehicles and pedestrians. Like many of the previous stops, this is a great location to snap some pics of the Swift River (and the gorgeous fall foliage, if you’re visiting in late September-October). Each season brings about new events and activities in the White Mountains New Hampshire. Due to heavy snow fall, popular winter activities include skiing (both slope and cross country), snowmobiling, snowshoeing, and tubing. Ziplining and off-road tours take place even during the snowy winter months. Experience the tradition of ice-block cutting and shop artisan crafts at the Ice Harvest and Winter Festival held each February. The Ice Castles in Lincoln NH grow in popularity each winter and are a magical sight to behold. Another popular activity during winter in the White Mountains is the Journey to the North Pole Train on the Conway Scenic Railroad. Hop aboard this specialty train for a jolly good time, available November and December. Fall in the White Mountains is ALWAYS a good idea! 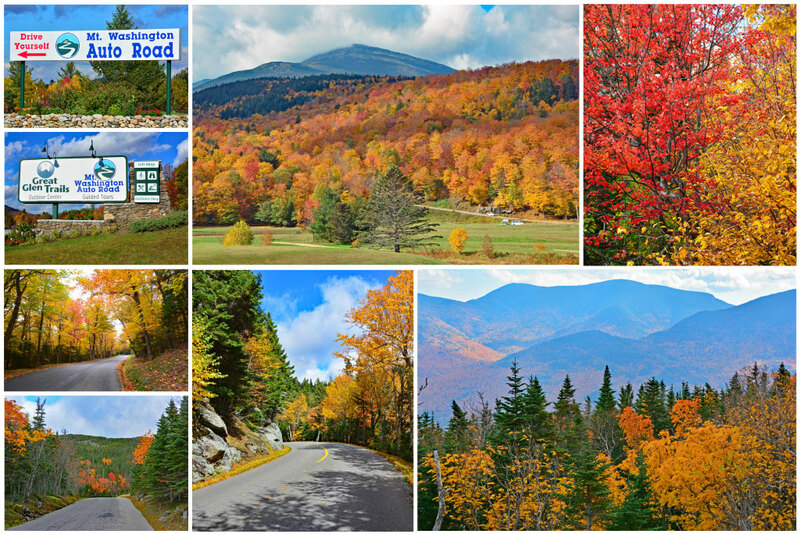 We visited the White Mountains in the Fall because we wanted to experience the renowned New England Fall foliage. It is an absolutely wonderful time of year to visit! Besides leaf peeping, there’s pumpkin picking and apple picking, corn mazes, and autumn festivals. You simply MUST try an apple cider donut! 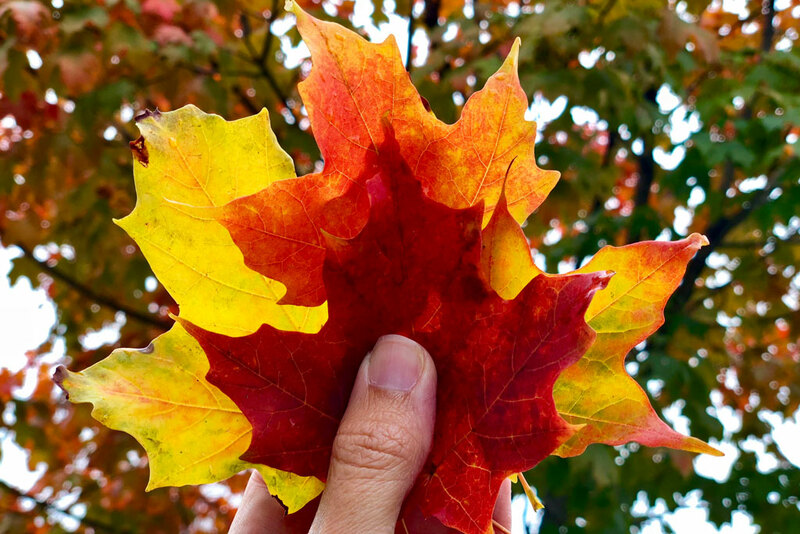 It’s a quintessential Fall in New England treat! 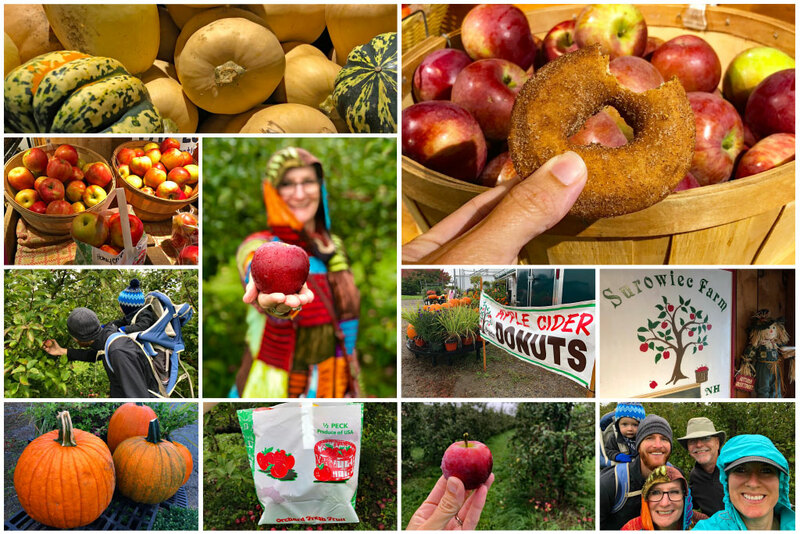 We had a great time apple picking with the family at Surowiec Farm in Sanbornton, New Hampshire, just south of the White Mountains. Our multi-generational family did a timeshare exchange for our trip to the White Mountains. We stayed at Cold Spring Resort in Ashland, about 25 minutes south of Lincoln. The unit, though a little dated, was absolutely perfect for our family. The two story townhouse we rented at Cold Spring Resort had a full kitchen, dining room, and living room complete with a suspended fire place. The screened-in porch and upper level balcony were wonderful for enjoying the crisp October air. Looking for places to stay IN Lincoln? 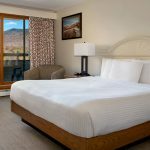 We’ve got you covered in our Lincoln NH Hotels and Accommodations post. So, as you can see, there are plenty of things to do in the White Mountains New Hampshire. If a weekend in the White Mountains is all you have, make the most of it. However, we recommend you spend at least 4-5 days exploring the area. Of course, if time and your budget allows, try to stay at least a week. 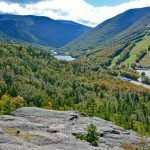 Between hikes in the White Mountains and all of the White Mountains activities listed here, you certainly won’t be bored! We hope you enjoy your visit to the White Mountains NH as much as we did!